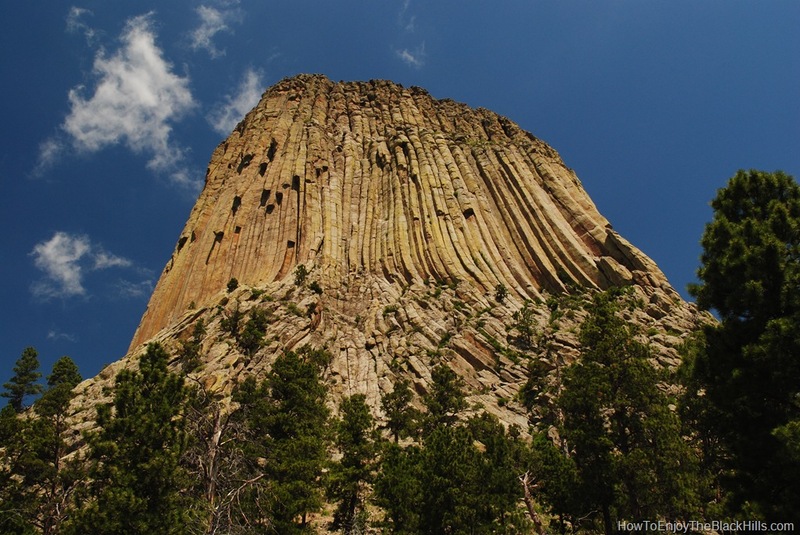 Devils Tower was declared the first National Monument by President Theodore Roosevelt in 1906. Now, over one hundred years later, the monument is still a place to enjoy the natural beauty of the area. The movie and the monument are still popular today. It is a great place for a day trip or stay the night in the campground or nearby Hulett WY. The name of the monument was supposed to have an apostrophe in the name (Devil’s Tower), however it was left out of the original proclamation and never corrected. You find the tower just west of the Bear Lodge portion of the Black Hills National Forest. It is 33 miles from Moorcroft WY, 27 miles from Sundance WY and 52 miles from Belle Fourche SD. There is a free map here – the free map can also be found at most filling stations and restaurants in the area. 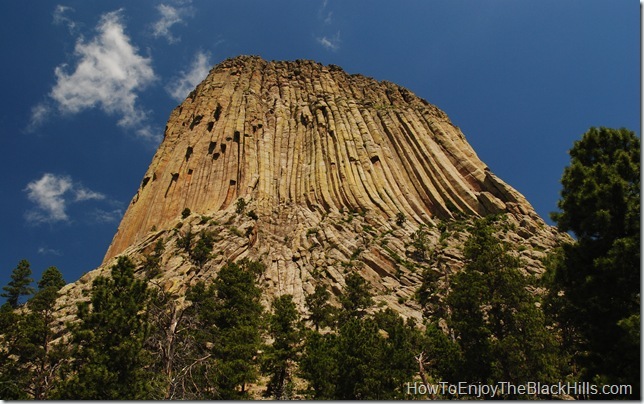 Can you climb Devils Tower? Yes, the tower is open to climbing. Climbing during the month of June is discouraged out of respect for the Native Americans. If you plan to climb, you must register with the ranger. The weather in the area can change quickly – so be prepared. On average, over 5000 people come each year to climb the tower. 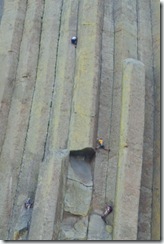 And, there are more than 220 climbing routes. 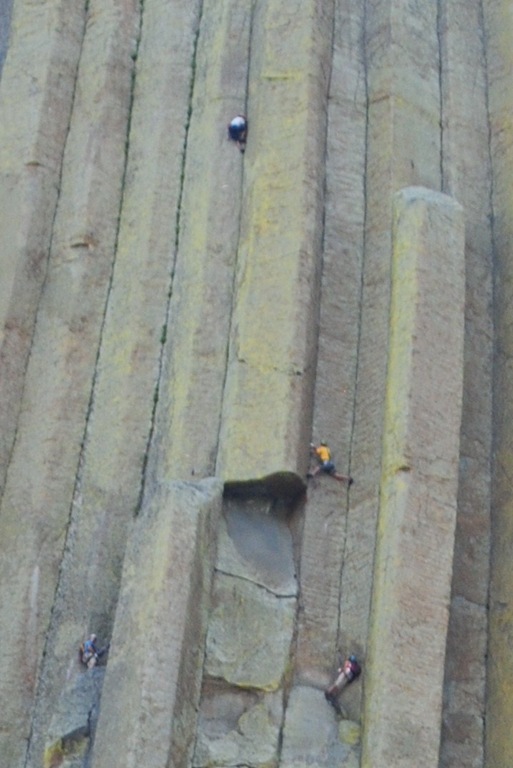 Be sure to study a book like Devils Tower Climbing before coming to the tower to climb. Five trail can be found in the Devils Tower National Monument area. Tower Trail – this paved trail is the most popular. It is 1.3 miles and circles the tower. This is a great trail to see the amazing natural feature up close and get at look at the climbers too. Red Beds Trail – this is a longer 3 miles trail. It makes a larger circle around the tower. You will travel through mix of timber and prairie. You can also connect with both the South Side Trail and Valley View Trail. Joyner Ridge Trail – this is a 1.5 mile loop trail or take the 0.6 miles spur to meet up with the Red Beds Trail. South Side Trail – 0.6 mile trail. Connects the Red Beds Trail to the Bell Fourche Campground. also connects to the Valley View Trail. Valley View Trail – Travels around the prairie dog town. Connects to both the South Side Trail (at the campground) and the Red Beds Trail. 50 campsites available in the Belle Fourche Campground. All are first come, first served. Three group campsites are available. Each site has a grill and picnic table. Fresh water is available. No hookups, shower or laundry facilities. The park is open all year long. Activities and the visitors center are generally open from Memorial Day through Labor Day. Visit the Devils Tower National Park Service page for more information.